The post How to plan the perfect Spring or Summer Rafting Trip for your Family in the Colorado Rockies appeared first on Breckenridge Whitewater Rafting. Should you rent a car? Should it be a day trip or an overnight trip? Any other activities other than rafting? What river should you raft? Here are some suggestions for planning that trip and giving you some answers as well. First thing first, where should you go for your rafting trip? If you are coming to Colorado you must decide if you are coming for more than just rafting or rafting first, other activities second. If rafting is the main activity you should definitely head down to Buena Vista. It is going to have just about everything you would need. If you want to do an overnight trip, Buena Vista is going to be fantastic for that. They offer a few overnight trips such as 24 hours on Browns canyon, a 2-day advance trip and for the more experienced paddlers a 3-day mild 2 wild. For all of these overnight trips just about everything is provided for you, except a sleeping bag and your personal items of course. If a full overnight on the water is not what the family is looking for there is always the option of renting a cabin and “roughing it” in a more comfortable setting. The family could partake in a full day on the water or a half day and then possibly do some ziplining or even rock climbing. So, for those families that choose to make their way to Buena Vista renting a car is a must! Buena Vista is a small quaint little town, where Uber and Lyft are far and few between, plus there are many other activities where having your own transportation is absolute must. Now if you choose to come to Denver to have more of a city adventure, but are still looking for some awesome outdoor activities, then Idaho Springs is the place for you. The Clear Creek is a great river for all abilities with plenty of times throughout the day. If you are a family with kiddos younger than 15 years of age then the gold rush is going to be the best for you then. It’s a great class III section of the river that is great for those as young as 6 years old, for those that have the older kids 15 years old or older the upper clear is a great class IV section of the river and will be a bit more difficult, but by no means less fun. For those family of experts there is the Lower Canyon section of the river, a very exhilarating Class V. In Idaho Springs there is also ziplining so you can add it to any 1/3 day or ½ day river trip. So, if the family wants to spend the day on the river they have that option too, by doing the outer limits ¾ day trip and you get to have an awesome BBQ lunch by the river too! So, with these ideas on planning a summer rafting trip with the family be sure to check out www.coloradorafting.net for all of the awesome trips offered throughout Colorado. The post Our Favorite Horseback Riding Tours near Breckenridge, Colorado appeared first on Breckenridge Whitewater Rafting. Are you looking for your next adventure in Colorado that will really make you feel as though you have connected with more than the Wi-Fi? Horseback riding is the solution you are looking for. This adventure is perfect for all groups and levels. It is an amazing tradition to start for a mother and daughter who are looking create an unbreakable bond, or a group of bachelors’ looking to create the perfect memory. If you have a group of friends trying to fill some days in your summer vacation? This is the most rustic trip you can engage in. Rocky Mountain horseback riding is great for anyone who wants to enjoy the views and breathtaking landmarks. The Rocky Mountains are some of the most glorious features that mother nature provided in America. These mountains provide a ton of adventures from skiing in the winter to rafting your summer away. The cliff sides and elevation gain of these mountains give people an edge to their favorite activities. Horse back riding in these mountains give you heights and views you may not have even known exist. Staying in the mountains in the summer is a great choice, as most activities are about two hours from the Front Range of Denver. Breckenridge is like the bull’s eye on the dart board of summer activities. This location is so prime it makes Optimus jealous. For horse back riding specifically, this area is an unbelievably convenient location. Our Favorite Horseback Riding Trip! If you travel north to the Gore Range, you’ll find yourself surrounded by sage and sunshine. Rusty Spurrs Ranch is in the heart of Kremmling Colorado. This lovely little town is known for its vast planes, Gore Canyon and there amazing chinese. Rusty Spurrs offers several trip times trough out the day. This gives you a chance to really tailor the trip and the times you’re on the trail to your vacation. Seeing the sun set can be a romantic trip for two and Kremmling is a perfect little spot to rekindle any relationship. The plans in this area allow for you party to really spread out, rather than nose to nose riding. Rusty’s also does a Cattle drive, which is a unique trip for only their location. This is a perfect way to spend the day for a group of men looking to spice up their trip to Colorado; or a simple group of friends looking for something a little different. Buena Vista holds one of the most stunning locations to horse back ride in. Mount Princeton Stables is in the Collegiate Peak range in the town of Nathrop. Known for there Hot Springs, this town is a great way to get away for a day. Planning a relaxing day on Horse Back to a waterfall. Filled with an evening of Hot Springs is one of the most romantic ways to appreciate Colorado. Mount Princeton Stables runs several trips and services all year allowing for several different types of views. Early spring when the peaks are still dusted with snow, are a sight to behold. Coming in summer when it’s warmest allows for all the flowers to be in bloom and animals moving about. If you looking to stick a little closer to Breckenridge, they happen to have a company right outside of town. This allows you to get into the mountains and back in time for dinner. This location is perfect for a quick get up and gallop. Being in the mountains you have been looking at for the past couple days is magical. The Breckenridge stables are conveniently located right at the top of town making it a perfect spot to travel to by the town bus rather than a car. Being able to take a horse into the mountain side is truly an inspiring way to use your time here in the mountains. If your planning a trip this year you, make sure horseback riding is part of it. The post Where the Locals are Rafting in Breckenridge appeared first on Breckenridge Whitewater Rafting. When you’re somewhere on vacation you are always looking for the inside scoop. You’re looking for the best local restaurant. You want to find where the secret powder stash is hidden. You want to know what the locals do for fun and where they go. Here is a little piece of that local knowledge on where to go whitewater rafting when vacationing in Breckenridge, Colorado. Breckenridge is a great jumping off point for rafting in Colorado. You have a bunch of different options within a short drive. Colorado whitewater is snowmelt driven. This means that rivers run at different times depending on the amount it snowed during the winter. There are also terrific options for all different levels of ability. So, I’m going to give you a few different options depending on the season. This is the closest river to Breckenridge, Keystone, and Frisco. This river has incredible views and is a terrific, family-friendly stretch of whitewater that offers plenty of adventure. This river is class II-III rapids making it a great river for intermediate and beginner rafters. The Blue River is known for its gold medal trout fishing and clear running water. Catch this run early June and July as it is a short and fast season. The upper Colorado is a trip for all ages and abilities. This trip has a couple class III rapids with a few other small ones in between. There many opportunities to get in the water and float on this trip. There are cliffs you can jump off into the water. There are hot springs located along the river bank. The whitewater on the Upper Colorado is relatively mild but still has its dangers. There are a few different options for this trip. You can choose from a half day guided trip, a full day guided trip, an overnight rafting trip, or you can even rent your own equipment. This trip is sure to be a blast for the whole family. If you’re looking for a physically demanding trip, then look no further than Gore Canyon. Located about an hour north of Breckenridge. This trip is not for the faint of heart, out of shape, or new to rafting. This trip is a class V rafting experience that involves constant paddling. It’s a beautiful remote canyon with technical rapids with steep gradients and big drops. If your looking for an action packed adrenaline filled trip gore canyon is your spot. This trip only runs late season as the water is too high most of the summer. This river has sections for most ages and abilities. They have half and full day trips run on this creek. Water is normally the highest in mid to late June but trips run all the way through Labor Day. This creek is very steep and technical. Full day and half day trips running most of the season. This river is about one hour from Breckenridge and about one hour from Denver. If you’re looking to do multiple activities in a day this river is for you as you can do a trip in only a few hours. Well now you know the scoop. All there is to do is go out and book your trip today. 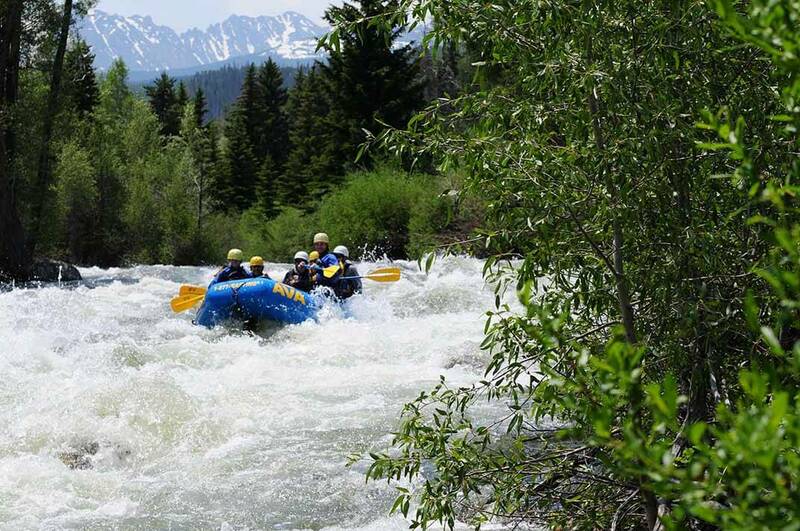 The post Colorado Adventure Packages you don’t want to Miss on appeared first on Breckenridge Whitewater Rafting. Colorado! The state full of all kinds of excitement and adventure. There are so many companies that offer great adventure packages throughout the year, but if you are looking for a great spring/summer Colorado adventure package look no further. Just one hour from Breckenridge, Kremmling is a beautiful place with all kinds of activities that are perfect for an adventure package. For those with families with smaller children under the age of 6 there are few options in Kremmling, CO. The 3 days scenic float trip is on the upper Colorado River. It is 3 days and 2 nights of awesome fun. You will be on Class II and one class III rapid through your 3 days on the river. We provide all of the camping gear, tent, sleeping pads, chairs, water, and firewood, with the exception of your personal sleeping bag and your personal items. No need to think about bringing food either as we provide all of that for the duration of the trip as well. During your free time you have the option to use the SUP boards or inflatable kayaks. You can also try your hand at fishing as long as you have your fishing license. With all of the gorgeous scenery and awesome gorges this trip will be great family adventure! This exciting experience allows you to enjoy two of Colorado’s most popular activities in one package! Spend your morning on a two-hour morning trail ride. After lunch, raft down the scenic Upper Colorado River for your ½-day raft trip on the wonderful Colorado River! All necessary equipment needed for horseback riding, rafting and included a delicious lunch. All you have to do is show up and enjoy the excursion. About an hour and half south of Breckenridge is the beautiful town of Buena Vista Colorado. From here you can raft the Arkansas River and visit our incredible outpost for ziplining, via ferrata and more. If you have never rafted before, but still looking for a great adventure then 24 hours in Browns Canyon would be a great option for you. This trip is basically all inclusive except for a sleeping bag. For the first day of the trip you will do the first half of Browns Canyon, once finished you will head back to camp where the guides set up everything for you during your free time, when you can go hike, fish, or just relax and then they make dinner for you all. Then a great breakfast, pack up camp and then finish the second half of Browns Canyon. This trip is also great for families with older children looking for more of a thrill than just a mild float trip. This 2 day action packed vacation is full of epic rafting as well as mountaintop ziplining and a wonderful night under the stars. Not only with you tackle 7 different ziplines and raft through the Arkansas river, but you will enjoy fresh cooked meals, campfires, and great company during your Brown’s Canyon Sizzler. For the ultimate Colorado adventure a 3 day wild to mild trip will be just what you are looking for! One the first day you will raft the Browns Canyon, break and have lunch by the river, continue on the water and then set up camp and prepare dinner. The second day you will raft the second half of browns canyon, enjoy free time around camp and dinner under the stars. The third day is going to be the most exciting as you be doing the Gauntlet where you will be taking on both class VI and V rapids called the Numbers and Pine Creek and of course an awesome hot lunch will be served riverside. 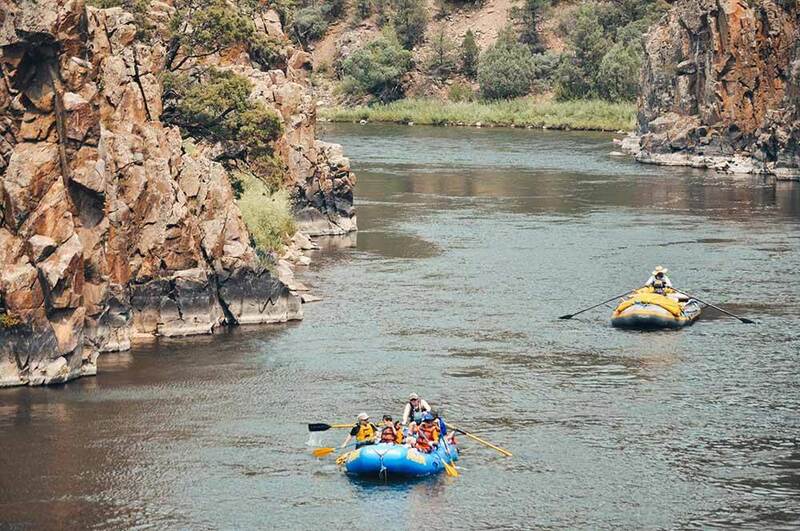 This all-inclusive trip is designed to give you the best that the Arkansas River has to offer. You would be rafting on all different classes of rivers. During your free time you will have the opportunity to rock climb, rappel, and use inflatable kayaks. Both day 2 and Day 3 will have breakfast provided for everyone. We offer more packages in Buena Vista. If you are interested in Rock climbing, via ferrata, and cabin rentals, check out what other packages we have to offer. Idaho Springs is about 30 minutes west of Denver and is the perfect spot for rafting, ziplining, and via ferrata if you don’t want to travel to far. This is the perfect adventure package for those age 15 years and older who want an awesome full day adventure. The day starts off with a cliffside zipline tour included 6 different exciting lines including bridges, free falls surf zip and more. After the exciting morning finish out the day on the river with a heart thumping rafting trip. We offer a number of packages to make your vacation not only stress free but also full of great times with wonderful guides. Don’t miss out on one of these packages for your next vacation and you will not be disappointed! The post Top 10 things to do on your Breckenridge Bachelor/Bachelorette Party appeared first on Breckenridge Whitewater Rafting. Weddings are a time of building amazing memories of love and laughter, where you have the chance to see a person express their genuine affection for another individual. These moments happen to also be seen from a different party that also takes place before the Wedding. You got it, the famous bachelor and bachelorette party. Filled with fond memories while getting intoxicated with close friends or complete strangers. This is unlike any other party, as these bonds can last forever from just one night. Making this trip memorable is super simple in the mountain town of Breckenridge. Being in one of the most active states in the country gives an extra flare to the party planning. Let’s break down the best places and things to do up here in this beautiful mountain town of Breckenridge CO.
Making sure the location accommodates everyone is a huge part of planning a party with people that can be from several parts of the country. Denver International Airport is a great location to meet from almost any where in the country as there are almost all direct flights to here. Once you’ve gathered the masses you can rent a couple vehicles to make sure the freedom of the mountains is at your fingertips. This is most beneficial for the active kind of trip. If you don’t want to worry about driving, look into getting a private charter. Depending on the size of the party this can be an affordable and fun option. There are shuttles such as Peak 1 Express that will take everyone from the airport to your hotel here In Breckenridge and then back to the airport. There are free buses that travel around Breckenridge called the Free Ride. This makes traveling around with out a car very easy. This application should be downloaded on your phone now before any visit to Breckenridge. The best part about a bachelor/bachelorette party in Colorado is the number of activities you can embark on. ATV Trail: Rent ATV’s near Breckenridge and enjoy the beautiful mountains in a fun way with your best friends. Fly Fishing: The Blue River is a beautiful and close River to Breckenridge for fishing. White Water Rafting: This is one of the more popular party activites and there is a reason everyone books a rafting tour. Horseback Riding: This activities has a little bit less of an adrenaline rush, but it sure is filled with amazing views, stories, and adventure. Ziplining: Zip through the Rocky Mountains with your friends and experience flight. Gun Ranges: A shooting range can be a fun activities for the group to partake in together. Red Rocks Amphitheater: Go to a concert in the most beautiful venue on earth made from natural Colorado rocks. Hiking: There are so many amazing hikes near Breckenridge that will get your blood flowing and leave you feeling transcendent. Hot Spring: There are plenty of hot springs that make great day trips from Breckenridge. Mountain Top Yoga: Yoga is a great way to get centered between all of the partying and it will be unforgettable if you do it on top of a mountain with your best friends. Breckenridge really is the center point to any of these activities, however you would have to drive to any of these outposts to be able to take any of these trips. If you’re looking to come during winter and keep it on the slopes. Or are looking to make it a girl trip with out all the adventures. Planning a place to stay should be the priority. Breckenridge has so many options from Hotels to Air B&B’s, you’ll be sure to find the perfect spot for your crew. We recommend checking out the bus schedule before you book and making sure there is a stop near your accommodations to save you from driving to and from town after a few beers. Normally winging it might be the way to go for most of you, not for this party. The only winging you should get into is the amazing double baked wings at Ollies in town. The Breckenridge distillery has its own transportation that will come right where you are staying and drop you back off at this location. The fact that you don’t have to think about driving in this town when your planning on drinking makes it a great spot to celebrate any occasion. Let’s be honest though if you are looking for the classic stripper and strip of bars, I would skip the mountains and head right to the dessert of Vegas. If your looking to make some amazing memories with your group, this town is the perfect spot for you. The post Why Breckenridge is the Best Colorado Mountain Town for Spring Break appeared first on Breckenridge Whitewater Rafting. As the end of the spring semester is in sight and finals a few weeks away, college students from all over the country take some time off from studying and get some rest and relaxation for a week usually in late March or early April. While most students in America will head to the nearest beach, people often forget or are unaware that there is still prime skiing at that time of the year. Whether you are taking a break from university or the whole family is getting out of town for some quality time together, Spring Break is a great time to enjoy the beautiful outdoors. All of Colorado’s ski resorts will be open and still have great snow during Spring Break. For those looking to hit the slopes for spring break, Breckenridge is where you should go, and here’s why! College Students: First, Breckenridge is easier and more affordable to get to than many of the other resorts. You can hop on a shuttle right at the airport and be at your hotel in just a few hours without burning a hole in your wallet! Some resorts like Crested Butte and Telluride require a good amount of extra travel time and cost. Families: Getting the entire family ready for a ski vacation can be challenging. Make it easier by hoping on a shared shuttle or reserving a private for the family and stop along the way to get groceries. Once you get dropped off at your door, vacation will commence. Whether you are a student or the whole family, getting to your destination can be challenging. Snow storms, traffic, and accidents can hinder vacation, so we recommend letting the professionals take you to and from the airport. As far as cost go, Breckenridge is one of the more wallet friendly destinations. When comparing the prices of lodging and lift tickets at Breckenridge versus Vail or Beaver Creek, you are going to be able to spend less. College students: We know that ski vacations don’t always seem affordable, but when booking in advance and looking for deals, Breckenridge can make for an unforgettable Spring Break that doesn’t break the bank. Families: Traveling with kids can add up, but luckily in Breckenridge there are plenty of free activities for children. They also get a discount on shuttles and lift tickets. Breckenridge also has an incredible downtown, and everyone and anyone will find a place that suits them in town. College Students: Main street Breckenridge is filled with great restaurants and shops. But unlike some of the other mountain towns, Breckenridge has a great night life scene. Dozens of bars are open late with great atmospheres. Breckenridge is a great place for students to meet others from all over the country and world that also wanted to hit the slopes during their break from their studies! Families: In addition to plenty of shops and restaurants to choose from, there are so many activities just for the kids. Visit the Children’s Museum or the Breckenridge Arts District for arts and crafts. One of the best features is Breckenridge’s free transportation. The high-altitude of the Rocky Mountains can make questionable road conditions. College Students: Also, a few adult beverages will have a much stronger effect in the mountains. The city has an amazing transportation system call the “free ride” that can get you anywhere you need to go in town! And if you’re looking to go a little further for the day, like skiing in Keystone or shopping in Frisco, Summit County has a free bus system called the “Summit Stage” that can get you anywhere in the county! With these free transportation systems, no student will have to get behind a wheel while they are here! Families: Another big reason to use the free transportation is the limited parking in Breckenridge. The bus will take you exactly where you need to go without having to hike around town from a parking spot. Lastly, students should come to Breckenridge for the world-class skiing. College Students: One of the bigger ski areas in the country, Breckenridge has endless terrain for all experience levels. For those who like black diamond runs, Breckenridge is home to the Imperial Express Chairlift is the highest chairlift in the world and takes you to the famous Imperial Bowl, lake Chutes, and Peak 7 Bowl! Families: Breckenridge is one of the most kid friendly resorts in Colorado. There are plenty of ski areas just for the kids, and there are great ski instructors who will spend the day with them, while the parents check out different terrain. So, forget the beach this year for your spring break and head to Breckenridge and have a the best spring break ever! The post Everything You Need to Know About Ullr Fest 2019 in Breckenridge, Colorado appeared first on Breckenridge Whitewater Rafting. Breckenridge will hold its annual celebration of the snow as Ullr Fest 2019 is set to return to the Colorado ski town on January 9-12, with 2019 marking the festival’s 55th consecutive year. Ullr Fest is a unique celebration centered around Breck’s Main Street that never fails to disappoint revelers seeking a party in between sessions on the slopes. Offering various competitions, a parade down Main Street, a bonfire, and more, Ullr Fest 2019 promises to be a party worth attending. Ullr is the Norse god of the snow and given the abundance of early season snowfall Breckenridge has experienced in 2018, it would seem that he’s in a rather good mood, promising an Ullr Fest 2019 that is surely not to be missed. Ullr Fest 2019 kicks off on January 9 at 6:30 PM at the Riverwalk Center with the crowning of the Ullr King and Queen in which two Breckenridge residents will be recognized for their contributions to the local community. This will be immediately followed by the Breck’s Got Talent competition hosted by local radio station Always Mountain Time. These events are free and doors open at 6:00 PM with the first 200 attendees receiving a free beer! The party continues on January 10 with the Ullr shot ski at 4:00 PM. Breckenridge is looking to hold the world shot ski record this year after last year’s shot ski boasted 1243 participants spanning 1250 feet down main street. The shot ski will be followed at 4:30 PM with the Ullr Parade down Main Street. Parade participants will compete for cash prizes for the parade’s most creative floats. Ullr Fest 2019 attendees looking to warm up a bit after the parade can head over to the south gondola parking lot for the Ullr bonfire from 5 PM to 7 PM. Feel free to bring your Christmas tree to help keep the fire burning. On Friday January 11, festival-goers can take a plunge into the icey cold waters of Maggie Pond at the base of peak 9. Head there between 2:00 PM and 4:00 PM for the Ullr ice plunge. Wearer of the best plunge costume can win a specially decorated Ullr helmet, so come dressed to impress. Later that day, warm up with a glass of bourbon-spiked punch at the National Punch Competition Throwdown Finale hosted by Breckenridge distillery from 4:00 pm-6:00pm. Some of the best bartenders around will compete to see who makes the best punch. Friday night, be prepared to laugh at the Riverwalk center for a stand-up comedy show featuring comedians Phil Palisoul and Elliott Woolsey starting at 8:00pm. An ice-skating party will begin the festivities on Saturday, January 12, the final day of Ullr Fest 2019. Head to the Steven C. West ice arena on Boreas Pass Road from 1:00 PM to 3:00 PM for skating and kids Ullr helmet decorating. 3:00 begins the Ullr Fat Tire Bike Race on Main Street where racers will proceed to the French Gulch trail. 70 bikers competed in the race during Ullr Fest 2018. Ullr Fest 2019 will conclude back at the Riverwalk Center at 6:00 PM for the Wild and Scenic Film Festival focusing on environmental issues and inspiring nature scenery. The annual Ullr Festival is one of the best ways to celebrate all that winter in the Rockies has to offer. Head to Breckenridge for what will most definitely be one of the best events of the season. The post Do You Want to Be a Part of the World’s Longest Shotski? Get Ready for the Breckenridge Ullr Fest 2019. appeared first on Breckenridge Whitewater Rafting. High in the mountains, holiday traditions can quickly grow into what could only be defined as yearly rituals. If you haven’t already experienced one of these traditions here in the Rockies, we have the perfect opportunity rapidly approaching. This yearly festival will take you to a time where myth and legend prevailed over all else. This is a time where Gods spun the world round and sewed the stars into the night sky. This festival is centered around Ullr, who was first written about in Norse mythology in which he is described as the step-son of Thor. Ullr is known as a master of archery, hunting, skiing, and a fierce warrior. In the mountains, UIlr is honored as the first to bring about skiing and it is said he would travel the world on his skies to hunt in the most remote of areas. When it comes to Breckenridge, every year locals and visitors alike will gather every year to celebrate ‘Ullr Fest”. The celebration takes place in hopes that Ullr will be pleased and reward the town with a season full of snowfall and powder-days out on the slopes! Ullr Fest begins on Wednesday, January 9th with the Crowning of the festival King and Queen which is a 56-year-old tradition that rewards two local residents for their contributions to the community. This fun ceremony takes place at the River Walk Center around 6:15pm and is followed by a local-featuring talent show called Breck’s Got Talent. This show is held by the radio station, Always Mountain Time. Be sure to get there early as the first 200 to arrive will receive FREE BEER! For those looking to register for this talent show, contact miranda@alwaysmountaintime.com. Not here until Thursday?? Well that just might be the best day to be here! The highlight of this festival takes place as over 1,200 people borrow connectable shot-skis and line up together to form one massive shot-ski that stretches as long as Main Street itself. For the small fee of $10 per person, the town lends participants a shot-ski and a shot from the Breckenridge Distillery in order to become a part of breaking the record for World’s Longest Shot-Ski. The shot-ski toast is only one part of the three-day festival to celebrate skiing, snowfall, and to thank Ullr for sharing the incredible sport of skiing with us. After Breckenridge has once again claimed the ever-prestigious world record, the party has just begun! Festival goers can simply gather on the sidewalks to enjoy a parade floats aplenty made by local companies. If you’re thinking that this parade most commence the Thursday Ullr festivities…. think again! The Ullr partiers can make the short walk from Main Street to the South Gondola Parking lot where residents have gathered their retired Christmas Trees for bid them farewell in the form of a massive bonfire accompanied by Red Bull provided DJs. When the heat from Thursday night’s fire has extinguished and Friday arrives, things really cool down with the Ullr Ice Plunge! Come gather around the Icy waters of Maggie Pond to watch as some of the bolder of the festival goers leap into an open section of the ice. Think you would like to be so bold to jump in yourself? Don’t forget to dress to impress as there is a Best Plunge Costume winner who will get their very own decorated Ullr helmet. And as awesome as it sounds to jump into freezing cold water and to walk away soaking wet, plungers can take advantage of heated changing rooms and hot tubs to help warm up those body temps. The incredible festivities continue Friday night with laughs at the River Walk Center for a night of stand-up comedy. Tickets for this comedy night are available now. You can also find tickets and registration for the Ullr Bike Race, the Wild Scenic Film Festival, and plenty more! So, grab your best Nordic gear and get ready to celebrate Ullr so he brings us a winter of snow that we won’t soon forget! The post Breckenridge, Colorado Christmas Events and Activities in 2018 appeared first on Breckenridge Whitewater Rafting. The post Plan Your Trip for the Lighting of Breckenridge and Race of the Santas 2018 appeared first on Breckenridge Whitewater Rafting. The entire winter is an amazing time to visit Colorado, but you would be hard-pressed to pick a better time to visit than December. The ski resorts are open, and the mountain towns are beginning to look a lot like Christmas. So why not come and visit the town of Breckenridge to take part in Christmas events like the Lighting of Breckenridge, and Race of the Santas on December 8th for a great weekend of holiday fun. If you’re looking for a day jam packed with all types of Christmas activities, December 8th in Breckenridge has you covered. December is a great time to visit Colorado. The resorts in the area are open and it’s beginning to look a lot like Christmas. So, why not come and visit the Town of Breckenridge for the Lighting of Breckenridge and Race of the Santas on December 8th for a great weekend of fun. As a part of MakeShift, the quarterly series promoting creative activities BreckCreate will be hosting a station where anyone can go create their own Christmas ornaments. This craft event is a free event but space is limited! For those with good boy and girl, four-legged companions, there will be a Holiday Dog Parade! All pups are welcome and costumes are highly recommended. The parade will march down from Main Street Station to the Blue River Plaza, then everyone from the parade is welcomed to gather in a special section to watch the Race of the Santas. For the little ones under 12 years of age, they have a race of their own! Kids get to participate in the Reindeer Run, and all the participants will receive antlers prior to the run. Immediately after the reindeer have completed their trot, the main race event of the day will begin… The Race of the Santas. Hundreds of Santas will help you get into the holiday spirit as they race through downtown Breckenridge. The more competitive Santas out there will want to head to the front of the starting line for their best chances to win an Ullr helmet and other prizes. If running is not your thing, no problem, the goal is simply to have fun and get into the holiday spirit. Walk it or even skip it, as long as you have a good time. Bring your own Santa suit or purchase one at the Breckenridge Welcome Center for $7. After the races are over and the sun has fallen behind the mountain, its time to flip the switch and officially welcome the Christmas season with the lighting of the town tree by non other than old Saint Nick himself. Everyone can gather right in the heart of Main Street to watch as Santa flip the switch and illuminate the Christmas lights. Santa will then head just across the street to the Old Masonic Hall, where BreckCreate will be hosting a holiday themed karaoke party to round out the night. Whether you choose to take part in all of these festivities are simply spectate, Breckenridge has a whole lot of Christmas cheer and is a perfect way to embrace the Christmas season.